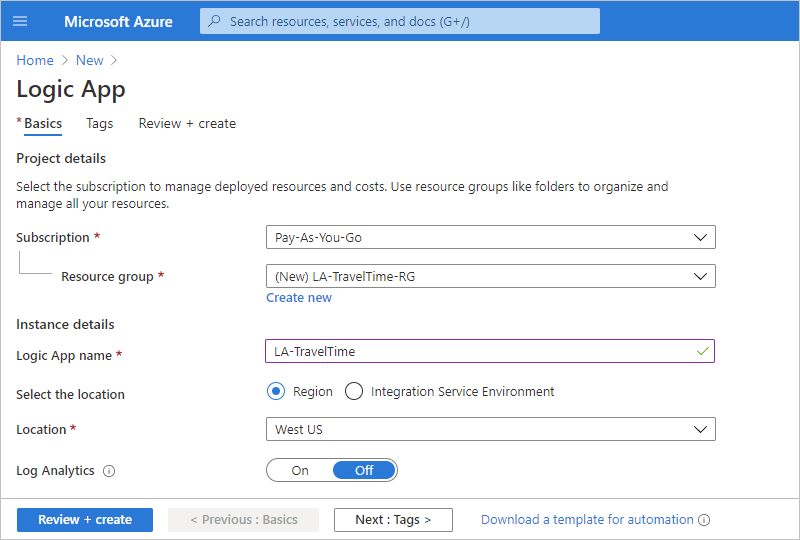 Azure Logic Apps helps you automate workflows that run on a schedule. 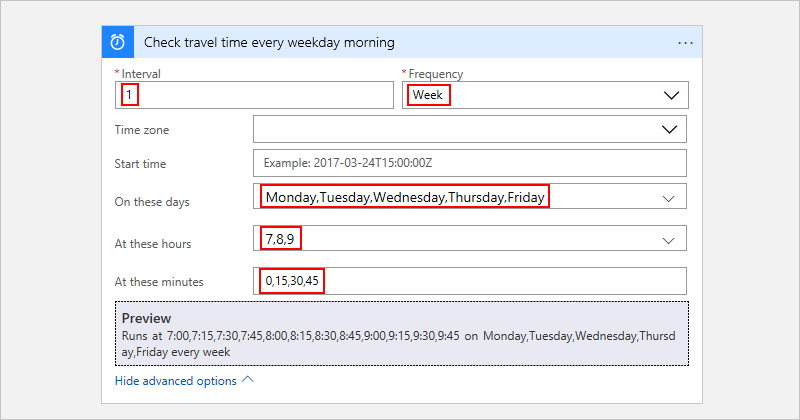 This tutorial shows how you can build a logic app with a scheduler trigger that runs every weekday morning and checks the travel time, including traffic, between two places. If the time exceeds a specific limit, the logic app sends email with the travel time and the extra time necessary for your destination. An email account from an email provider supported by Logic Apps, such as Office 365 Outlook, Outlook.com, or Gmail. For other providers, review the connectors list here. This quickstart uses an Outlook.com account. If you use a different email account, the general steps stay the same, but your UI might appear slightly different. 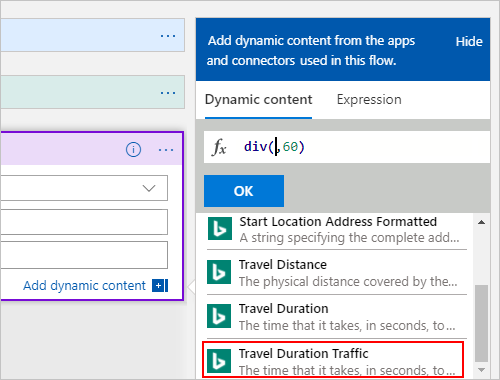 To get the travel time for a route, you need an access key for the Bing Maps API. To get this key, follow the steps for how to get a Bing Maps key. Next, add the recurrence trigger, which fires based on a specified schedule. Every logic app must start with a trigger, which fires when a specific event happens or when new data meets a specific condition. 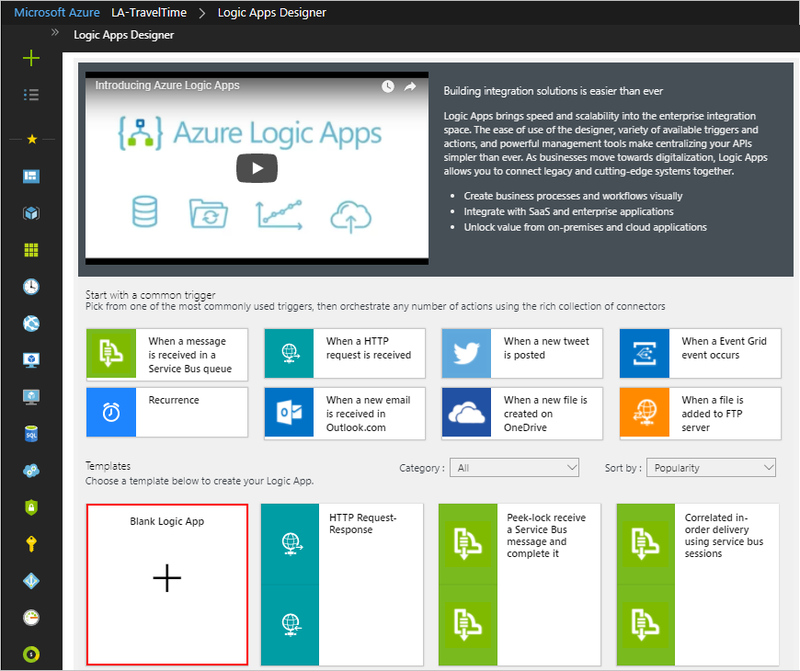 For more information, see Create your first logic app. Time zone None Applies only when you specify a start time. Useful for specifying a non-local time zone. Start time None Delay the recurrence until a specific date and time. For more information, see Schedule tasks and workflows that run regularly. On these days Monday,Tuesday,Wednesday,Thursday,Friday Available only when Frequency is set to "Week"
At these hours 7,8,9 Available only when Frequency is set to "Week" or "Day". Select the hours of the day to run this recurrence. This example runs at the 7, 8, and 9-hour marks. At these minutes 0,15,30,45 Available only when Frequency is set to "Week" or "Day". Select the minutes of the day to run this recurrence. This example runs every 15 minutes starting at the zero-hour mark. This trigger fires every weekday, every 15 minutes, starting at 7:00 AM and ending at 9:45 AM. The Preview box shows the recurrence schedule. For more information, see Schedule tasks and workflows and Workflow actions and triggers. To hide the trigger's details for now, click inside the shape's title bar. Your logic app is now live but doesn't do anything other recur. So, add an action that responds when the trigger fires. Now that you have a trigger, add an action that gets the travel time between two places. 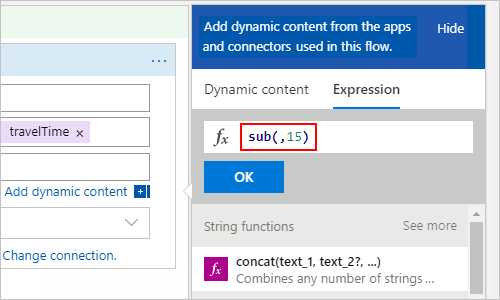 Logic Apps provides a connector for the Bing Maps API so that you can easily get this information. 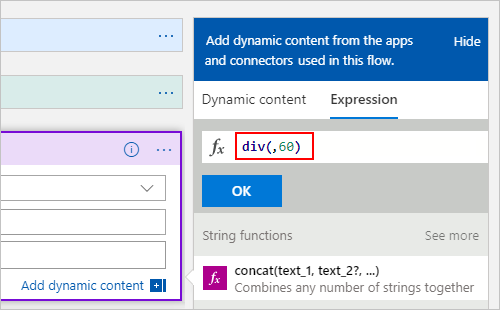 Before you start this task, make sure that you have a Bing Maps API key as described in this tutorial's prerequisites. If you don't have a Bing Maps connection, you're asked to create a connection. Provide these connection details, and choose Create. Connection Name BingMapsConnection Provide a name for your connection. API Key <your-Bing-Maps-key> Enter the Bing Maps key that you previously received. If you don't have a Bing Maps key, learn how to get a key. 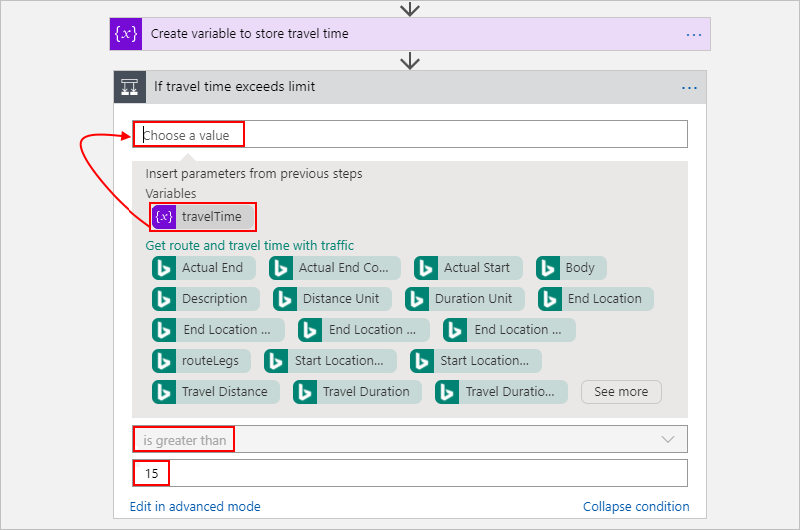 Optimize timeWithTraffic A parameter to optimize your route, such as distance, travel time with current traffic, and so on. Select this parameter: "timeWithTraffic"
Distance unit <your-preference> The unit of distance for your route. This article uses this unit: "Mile"
Travel mode Driving The travel mode for your route. 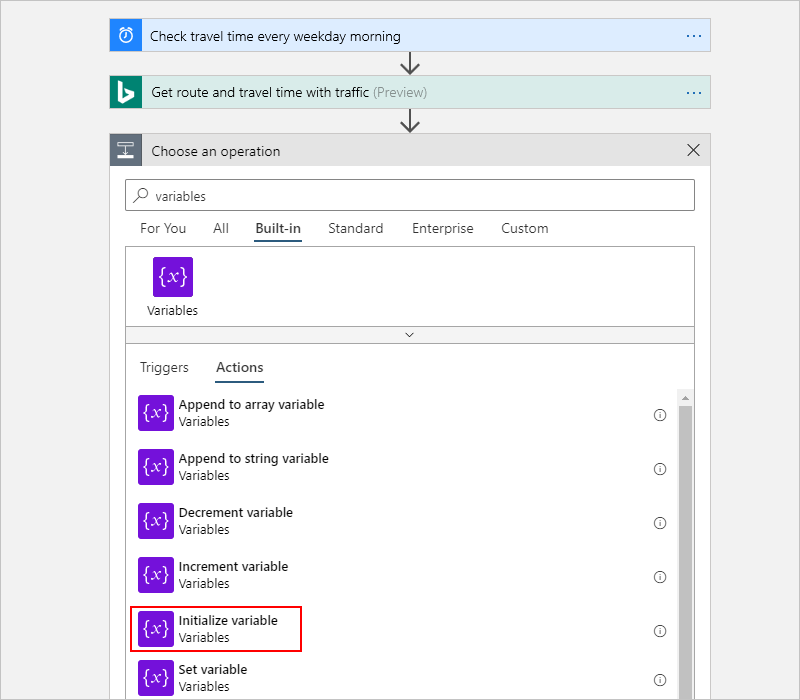 Select this mode: "Driving"
Next, create a variable so that you can convert and store the current travel time as minutes, rather than seconds. That way, you can avoid repeating the conversion and use the value more easily in later steps. Sometimes, you might want to perform operations on data in your workflow and use the results in later actions. To save these results so that you can easily reuse or reference them, you can create variables to store those results after processing them. You can create variables only at the top level in your logic app. When you click inside some edit boxes, either a dynamic content list or an inline parameter list appears. This list shows any parameters from previous actions that you can use as inputs in your workflow. 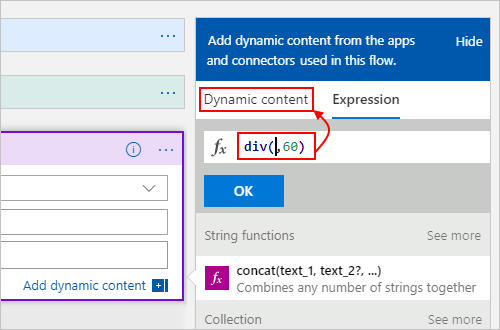 The dynamic content list has an expression editor where you can select functions for performing operations. 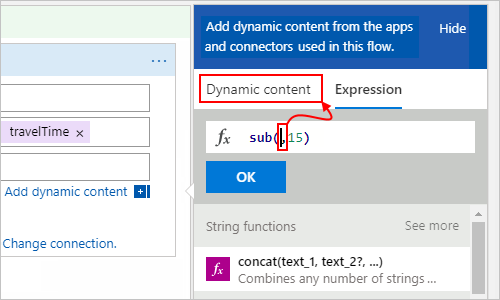 This expression editor appears only in the dynamic content list. Your browser width determines which list appears. If your browser is wide, the dynamic content list appears. If your browser is narrow, a parameter list appears inline under the edit box that currently has focus. 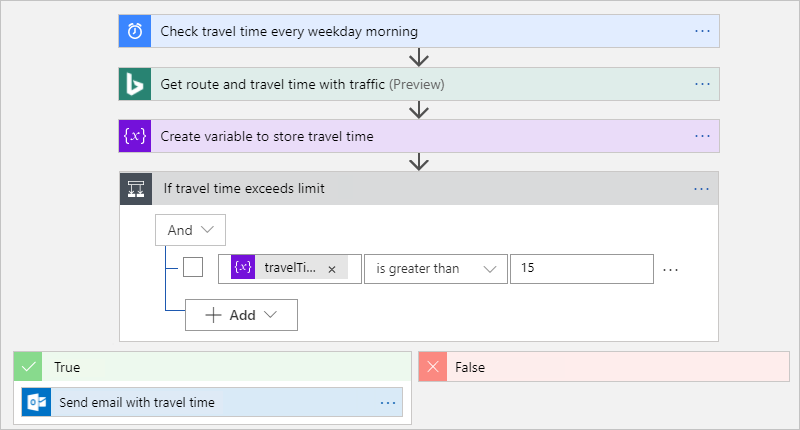 Next, add a condition that checks whether the current travel time is greater than a specific limit. Next, add the action to perform when the travel time exceeds your limit. In the condition's If true branch, choose Add an action. Search for "send email", and select the email connector and the "send email action" that you want to use. If you don't already have a connection, you're asked to sign in to your email account. 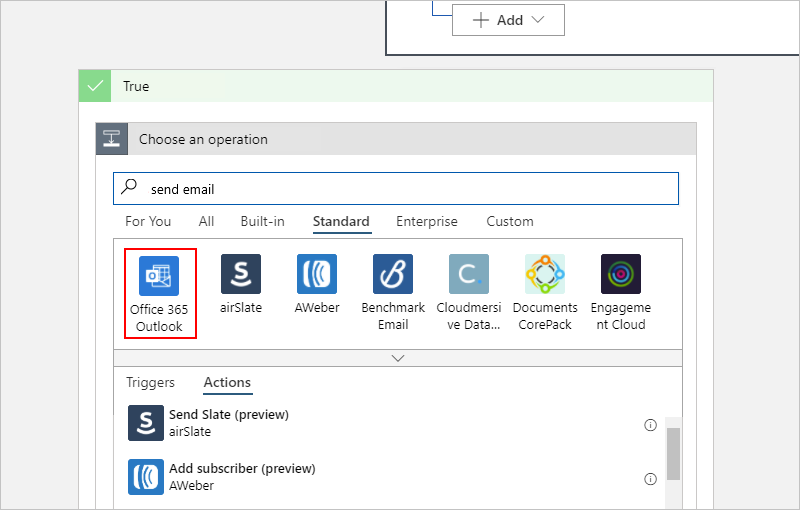 Logic Apps creates a connection to your email account. In the To box, enter the recipient's email address. For testing purposes, use your email address. 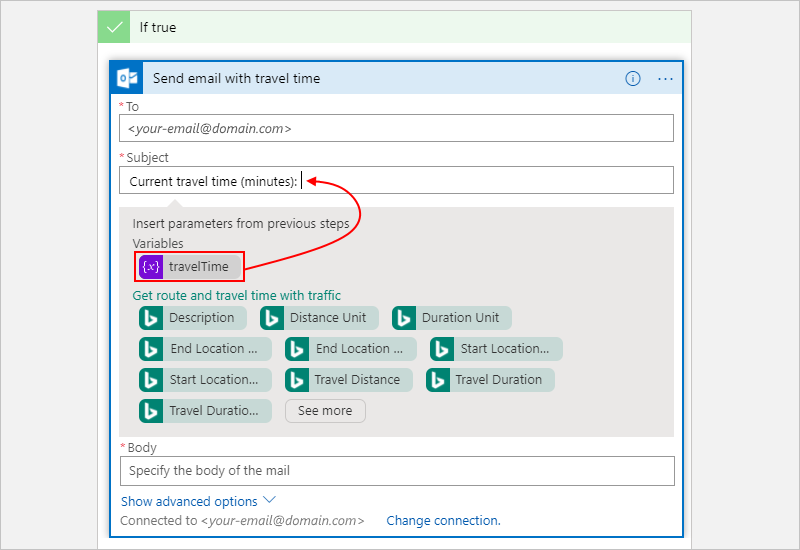 In the Subject box, specify the email's subject, and include the travelTime variable. Enter the text Current travel time (minutes): with a trailing space. 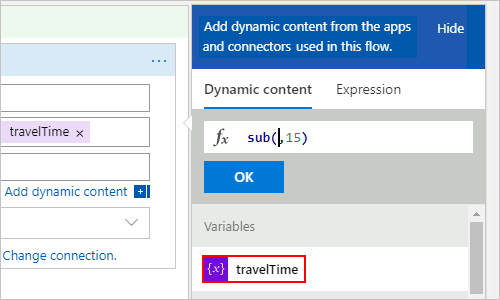 Enter the text Add extra travel time (minutes): with a trailing space. Congratulations, you've now created and run a schedule-based recurring logic app. Get daily reminders sent to you. 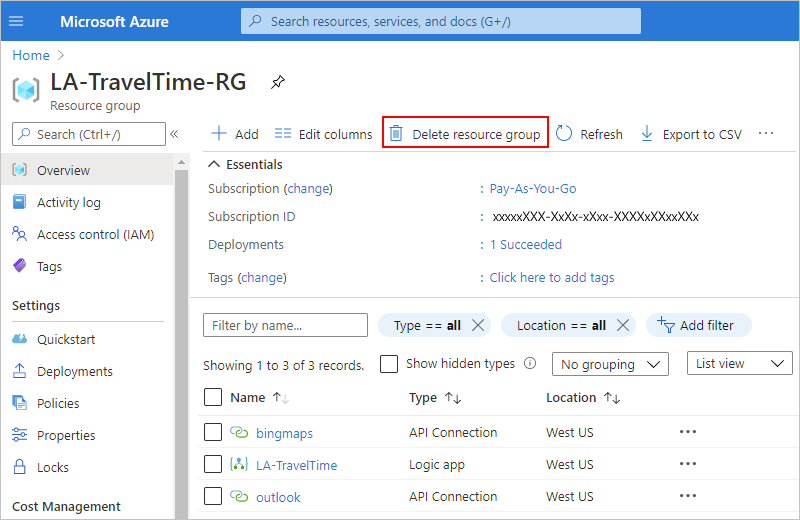 Add a message to an Azure Storage queue. 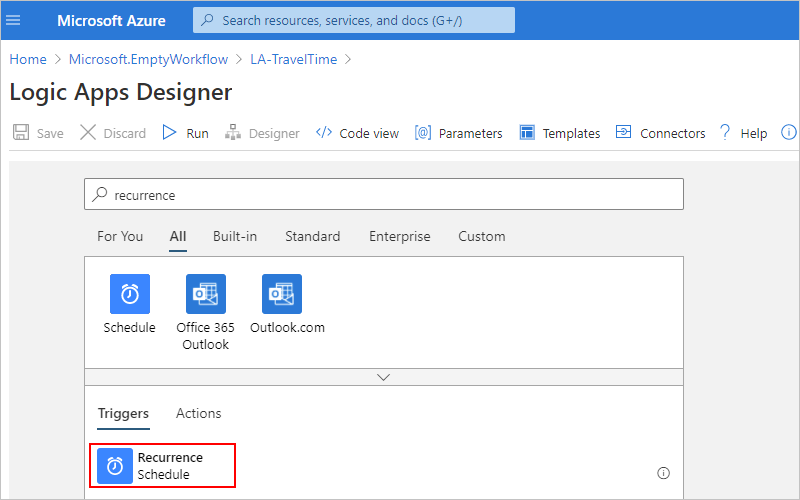 In this tutorial, you created a logic app that checks traffic based on a specified schedule (on weekday mornings), and takes action (sends email) when the travel time exceeds a specified limit. 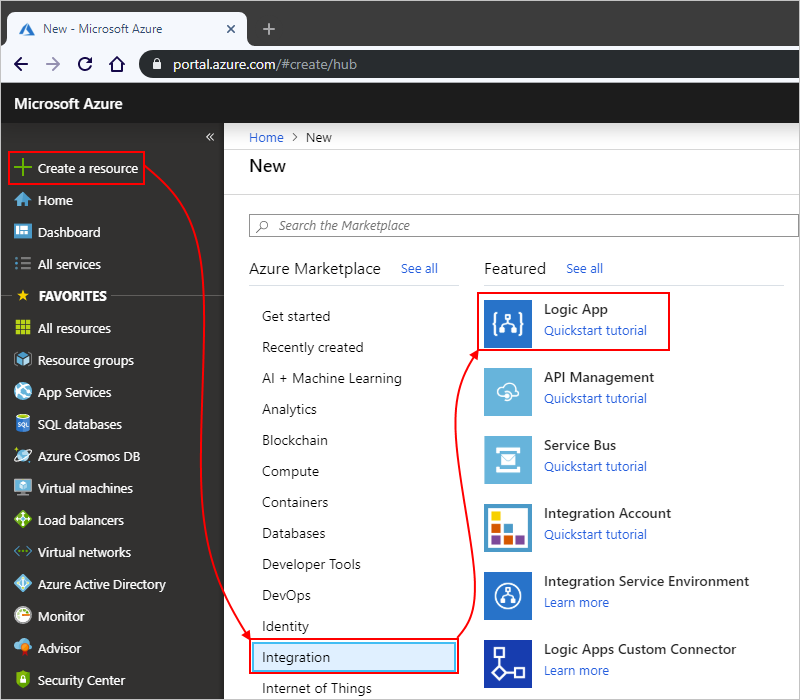 Now, learn how to build a logic app that sends mailing list requests for approval by integrating Azure services, Microsoft services, and other SaaS apps.